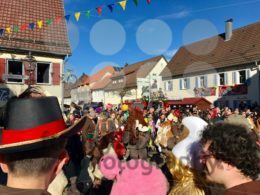 Weil der Stadt, Germany – February 11, 2018: Traditional carnival in South Germany – Swabian-Alemannic Fastnacht. 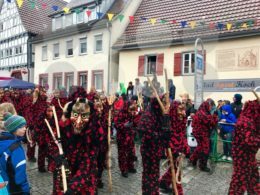 A local group is joining the carnival procession wearing traditional costumes and wooden masks. 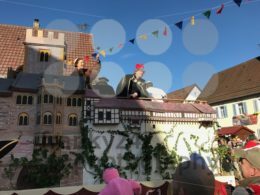 Weil der Stadt, Germany – February 11, 2018: Traditional carnival in South Germany – Swabian-Alemannic Fastnacht. 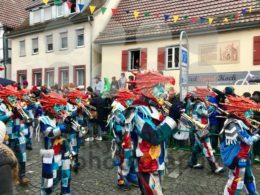 A local group in fancy costumes is performing traditional Guggenmusik, brass and percussion music during the carnival procession. 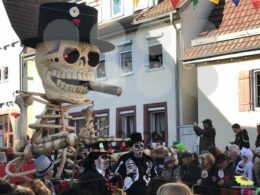 Weil der Stadt, Germany – February 11, 2018: Traditional carnival in South Germany – Swabian-Alemannic Fastnacht. 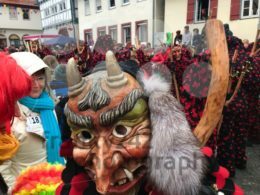 A male witch wearing a wooden mask is approaching visitors of the carnival procession. 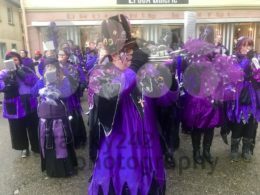 Weil der Stadt, Germany – February 26, 2017: The Oldstyle Gugga Aidlingen music corps is performing as part of the traditional festive and cultural carnival procession called Fasnet in Weil der Stadt, Germany. 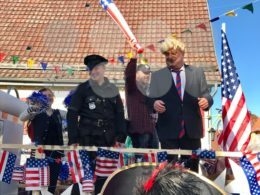 Weil der Stadt, Germany – February 26, 2017: A vehicule is making fun of the US president Donald Trump while taking part on the traditional festive and cultural carnival procession called Fasnet in Weil der Stadt, Germany. 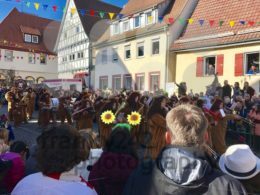 Weil der Stadt, Germany – February 26, 2017: Traditional festive and cultural carnival procession called Fasnet in Weil der Stadt, Germany. 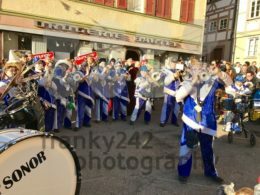 The local music corps Merklingen Loewen (Lions) is marching through the crowd while performing their songs.